The Øya Festival 2016 is on this week! 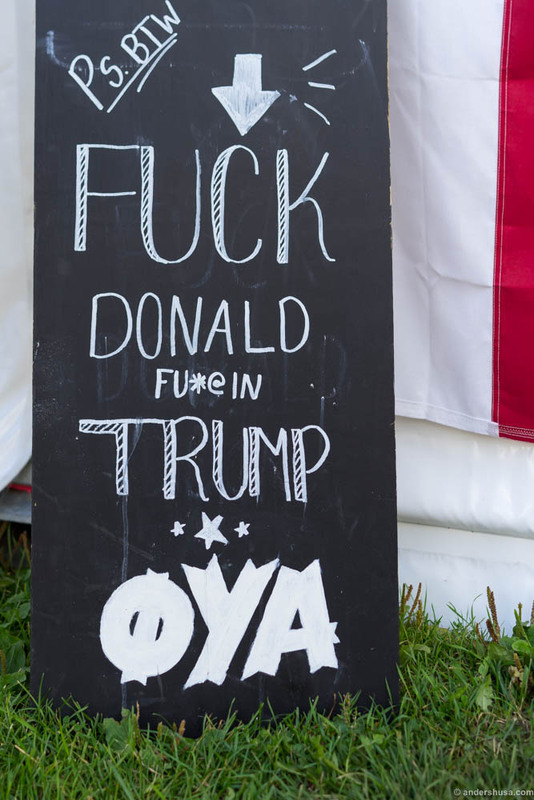 Øya is one of the most interesting music festivals in Norway, not only because of the great artists and independent bands, but also due to a huge organic food market. Last year I gave my input on the various street food at the festival, but my post came quite late. This year, I will do the same as I did with the Gladmat food festival: A live updated article with the best food! That way you know which dishes to select in your break between Aurora and Massive Attack, or after you’ve watched Erlend Ropstad and await PJ Harvey. 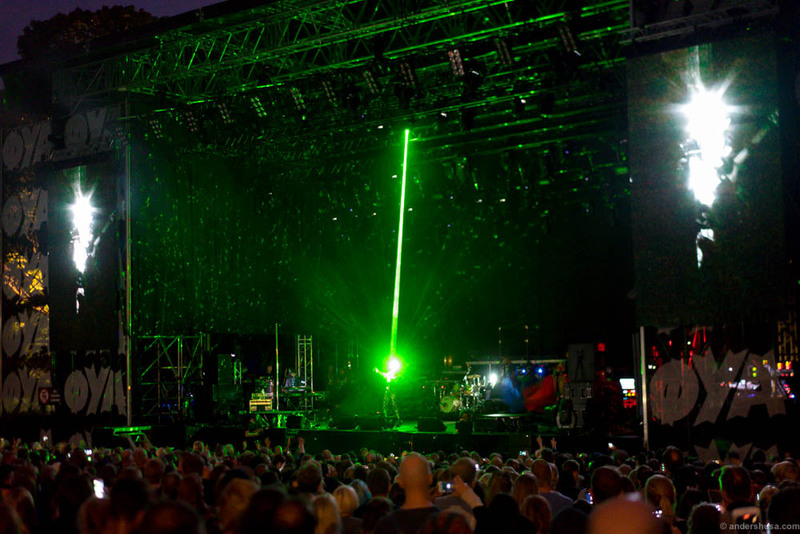 Organic food has been an important part of the Øya festival’s identity since 2003. 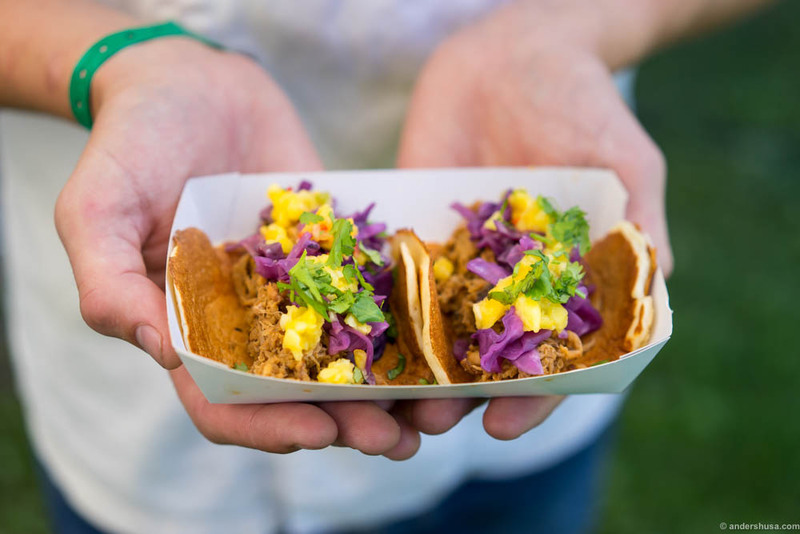 There’s some cool news this year: the plates are environmentally friendly and biodegradable! The new plates are made solemnly from wheat bran, water vapor, and pressure. According to the festival’s news site, they can even be eaten. I strongly doubt they’ll be the winning dish, though … (Update: I tasted them. Yuck!) 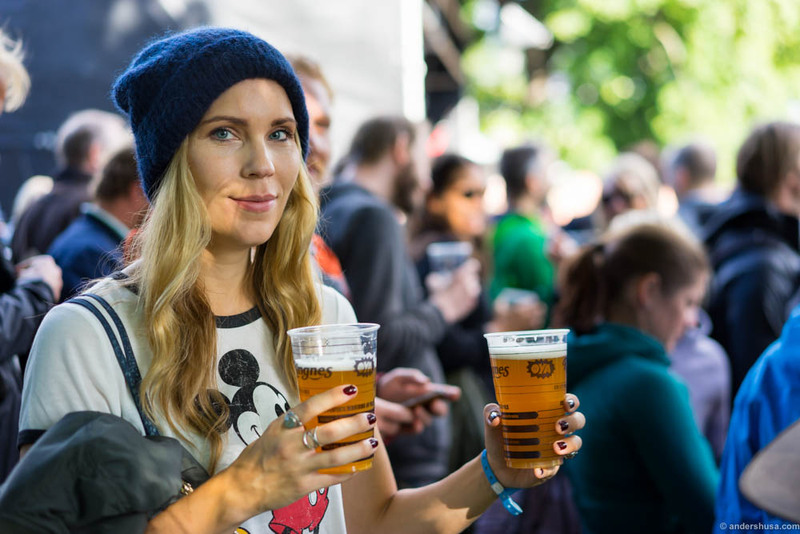 Furthermore, the Øya festival offers unfiltered and organic beer in cooperation with Ringnes this year. 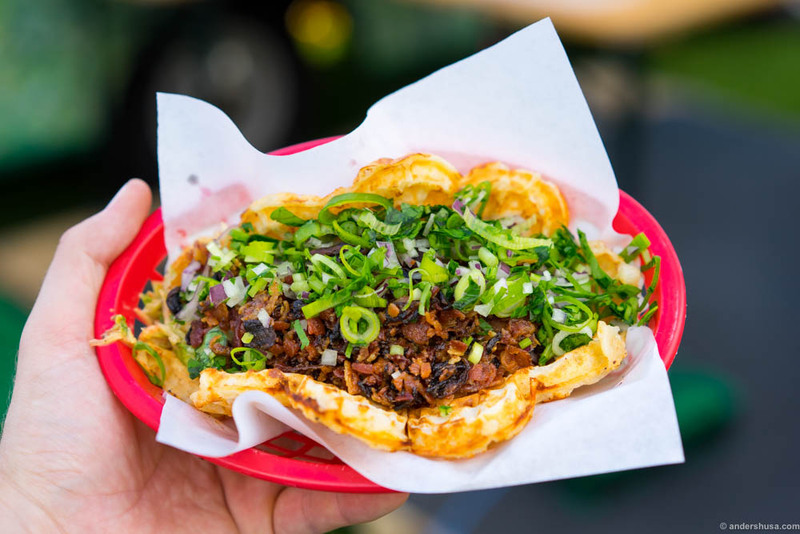 The area with all the street food vendors is called Munchløkka. I’m looking forward to checking out the dishes that Helle & Erik have created for Tine on their trip around the world. I always expect high quality from Hitchhiker, Smalhans and Anni’s Pølsemakeri, and I’m also excited to see what Ragnalokk and Aymara have to offer. I am not sure if this is a complete list of all participants, but I am headed to the festival area now to find out. Hitchhiker did it again! Last year they served an amazing kimchi waffle. The new version is cheese & bacon waffle. I’ll admit I was a bit skeptical initially. Waffle, cheese, and bacon combined sounds very rich and heavy. However, the Hitchhiker guys are street food-pros. They managed to balance the flavors with a lot of greens as well as acidity and spices in the chipotle-slaw underneath. The waffle is light, airy and crisp. Each waffle is freshly made just moments before it is served. 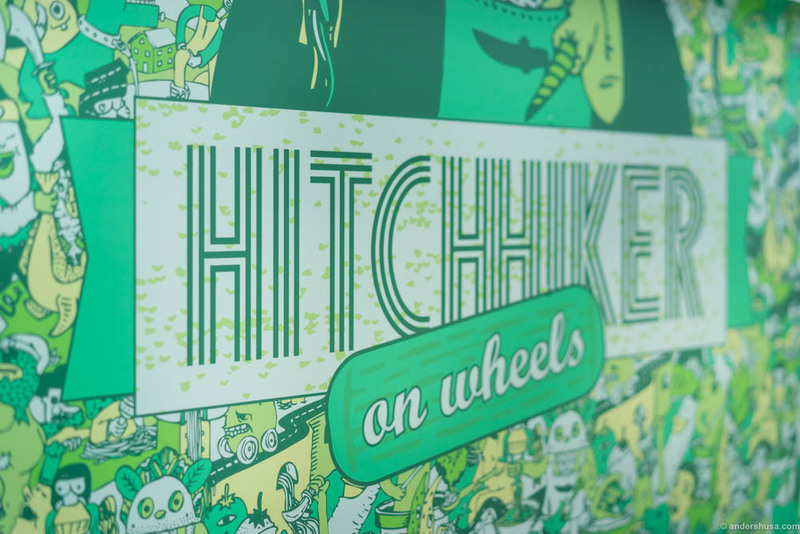 Hitchhiker can make it vegetarian, lactose-free and gluten-free if you ask. Smalhans has a superb dish this year. 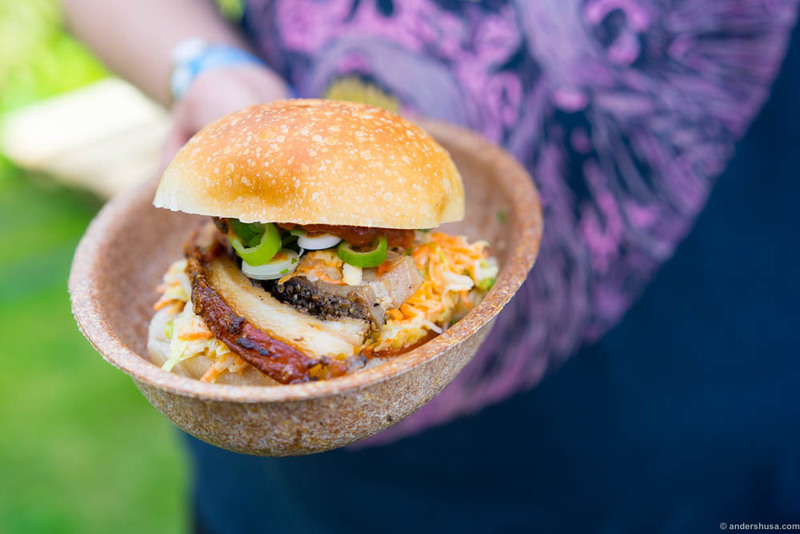 I liked the Korean BBQ wrap they did last year, but thew new BBQ porchetta bun with kimchi salad is even better. The burger bun is organic sourdough bread from Handwerk. An improved dish in terms of flavor compared to 2015, that also works much better as street food in a festival. Make sure to ask for extra Sriracha on top. The Sriracha is not organic, but come one … it’s Sriracha! To quote my friend Markus: Anni’s Pølsemakeri is upping the pølse game this year! 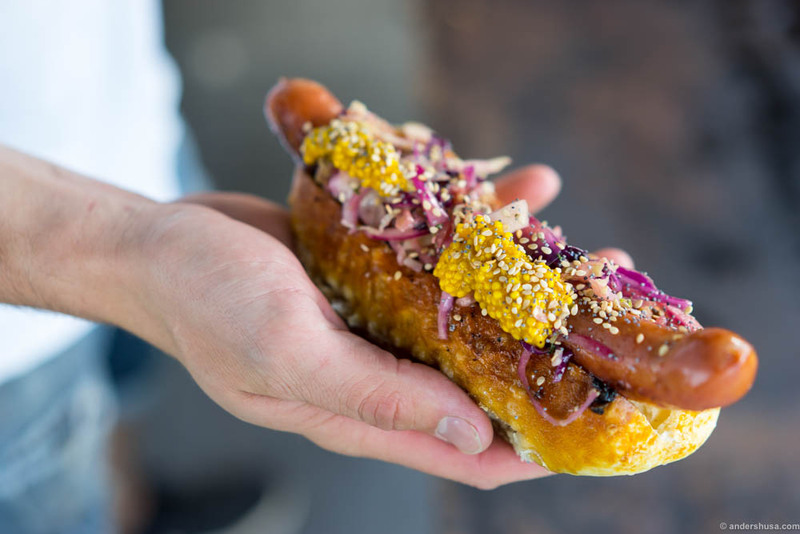 In 2015 they served sausages and burgers, but this year they focus on their specialty. 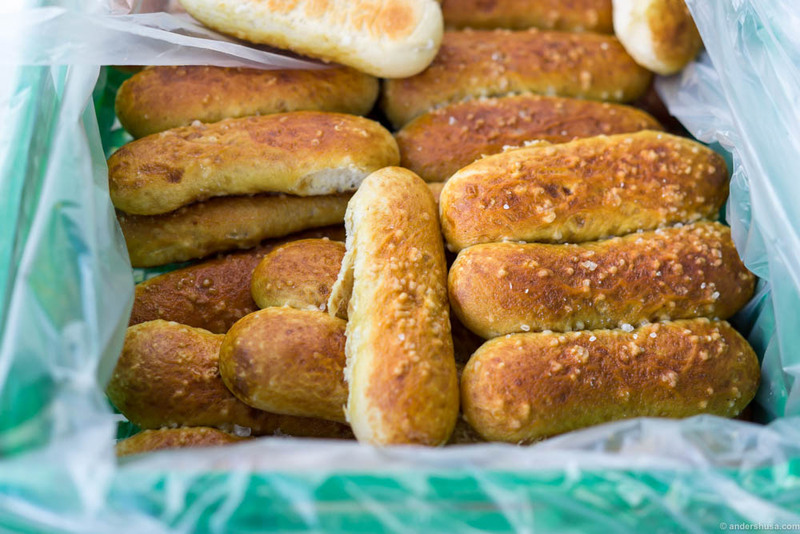 Everything is homemade – the bread, the mustard and the cabbage & onion salad. I tasted the grilled sausage in a pretzel bread. The bread is very unique! Fluffy, light and with the characteristic pretzle skin. The sausages at Anni’s are always full of flavor, and the homemade garnish is a great bonus. 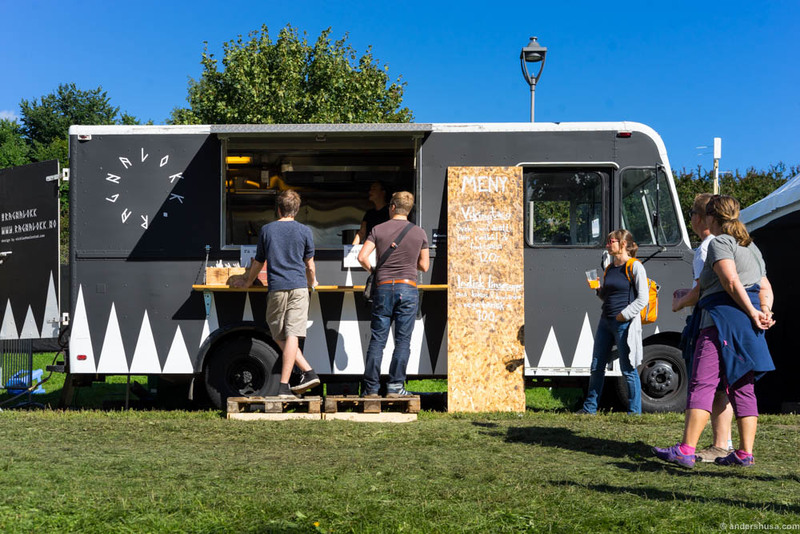 The food truck Ragnalokk by restaurant Lokk is located outside of the main food market Munchløkka. You find it on top of the hill behind the stages Vindfruen and Amfiet. Chef Martin Troset has composed a unique dish for the Øya festival. Classic Norwegian svele, which is a sort of thick American-style pancake, but made with tjukkmelk from Rørosmeieriet in stead of the traditional buttermilk. It’s filled with organic pork from Grøstad Gård and Slakter Eide, and topped with both ripe and unripe mango and cabbage pickled in appe juice. The pancake is slightly less sweet than a dessert pancake, but not much. The mix of ripe and unripe mango further helps balance the flavors. I loved the combination of sweet and savory in this dish. 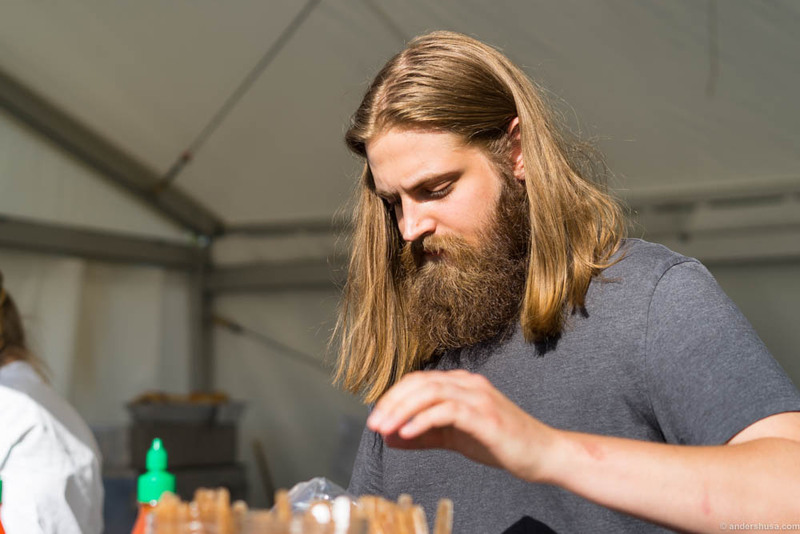 The organic sourdough bakery Handwerk is represented at the Øya festival once again. I tried their Croque Monsieur. 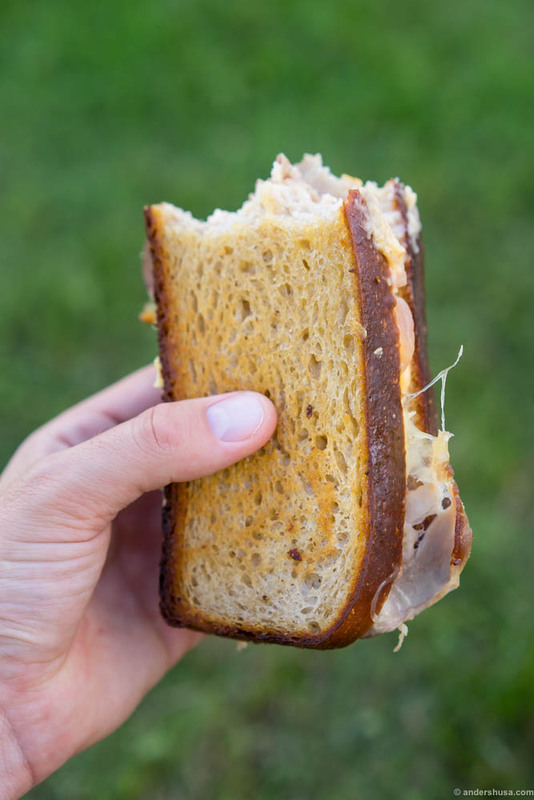 It’s a butter fried toast filled with smoked ham, caramelized onions and loads of delicious cheese béchamel sauce. Fat, fat and more fat! Delectable. A friend of mine commented that the price of NOK 75,- was a bit steep for a toast, but in my opinion you have to consider the quality of the ingredients and the fact that you get quite full from this amount of carbs and fat. 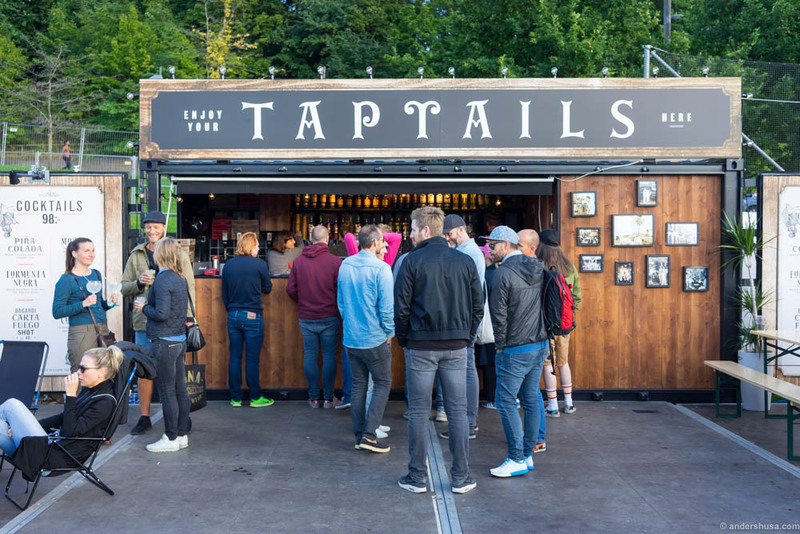 In the VIP-area Bacardi and Behind Bars have set up a taptails bar. That’s right, not cocktails, but taptails. 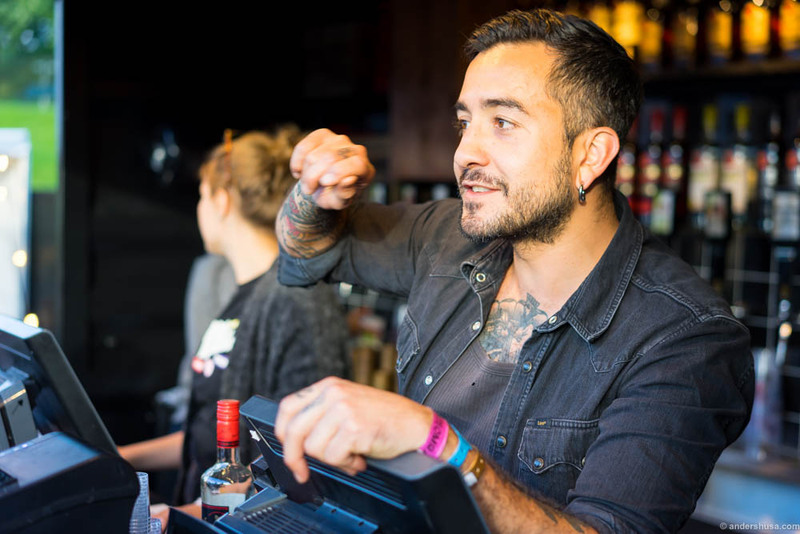 Ready-made cocktails served on tap. Get a refreshing option like the St. Germain or the more sweet and tropical retro drink Piña colada. Give it a try if you have the VIP access! 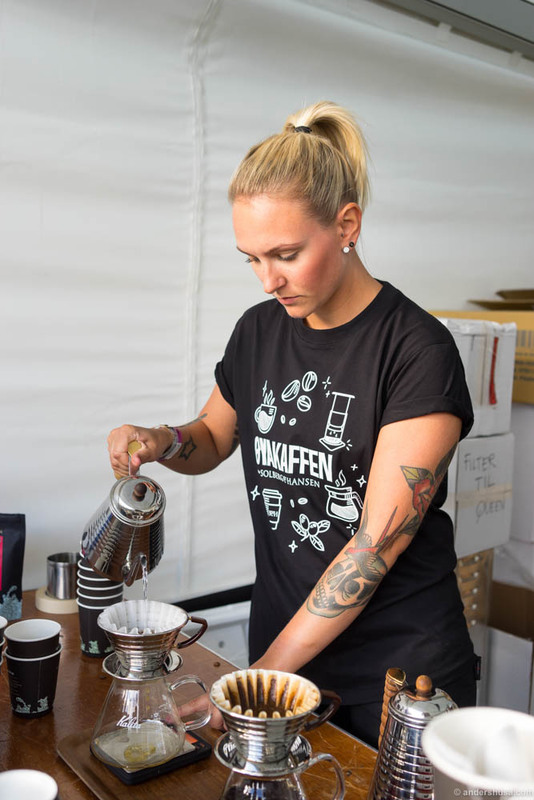 Solberg & Hansen is the official coffee-supplier to the Øya festival this year as well. That means Øyakaffen is of high quality and brewed by professionals, whether you go for the daily special or the even more exclusive Kalita-brewed variety. I really respect the strict requirements and demands that the Øya festival has to all their partners. 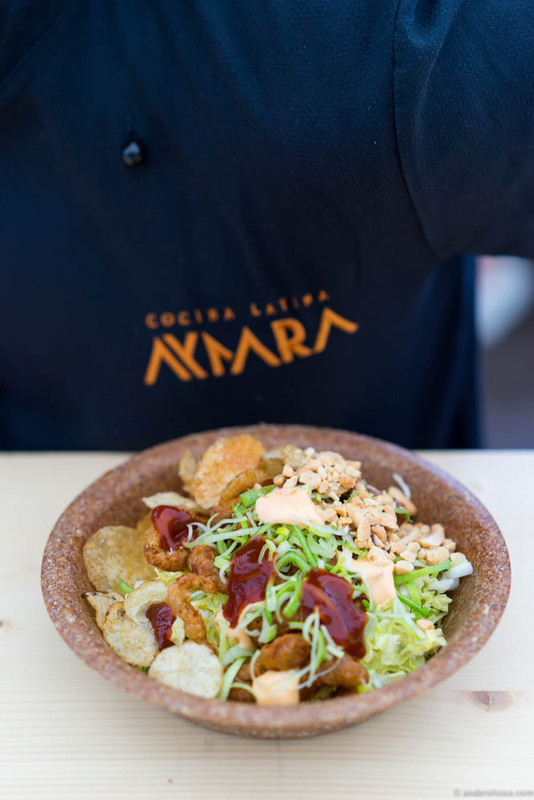 Aymara did a pop-up on Friday only, where they served their amazing potatoyaki. I’ve previously enjoyed that in their restaurant on World Pisco Sour Day. That was my favorite dish from that night, and it was very nice to have it again. Potatoyaki is Aymara’s twist on takoyaki, but it’s made with potatoes in stead. The dish featured lots of crunchy elements: crispy salad, potato chips and peanuts. It was covered in a generous amount of okonomiyaki sauce and Kewpie (Japanese mayo). So delicious! 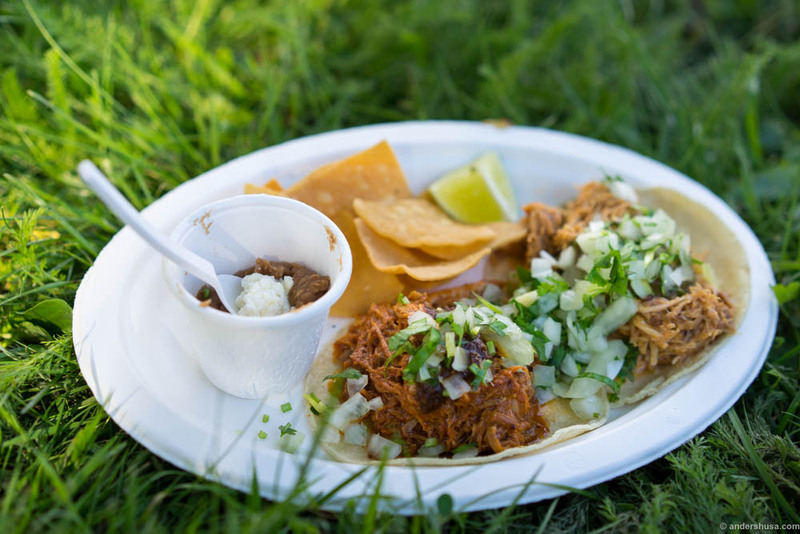 Is taco the ultimate street food? 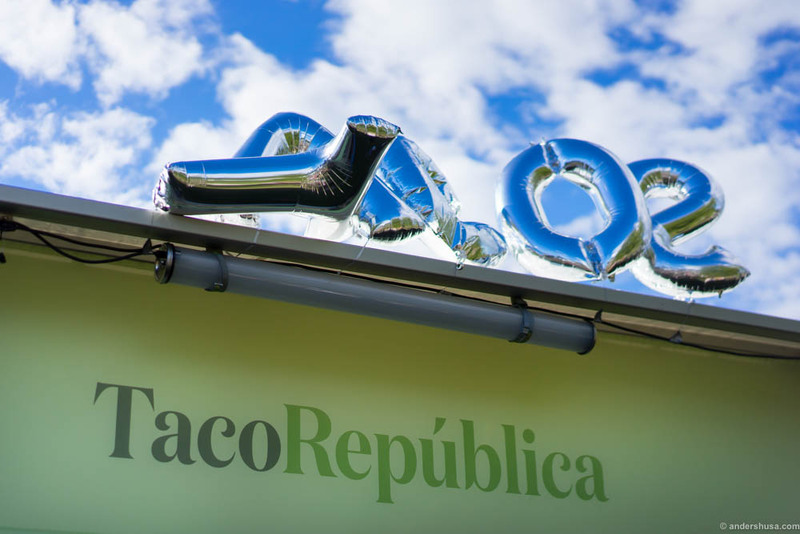 At least I never decline a good taco at a festival, so I had to give Taco Republica a go. Both tacos were quite decent, and to a large degree what I expected from this restaurant. However, it’s a bit disappointing that they serve pretty much the same kind of dish that you get in their restaurant. Why not make a fun festival version? 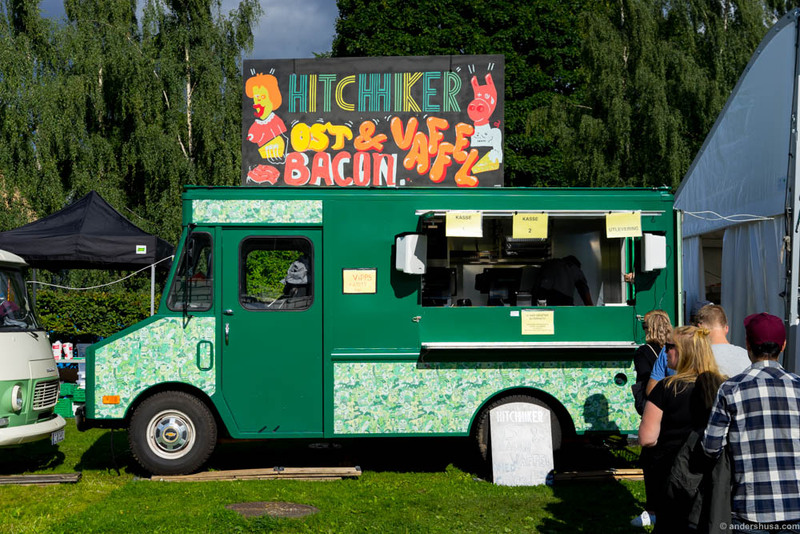 The same goes for a large part of the western row of food trucks at the Øya festival this year. Overall, the quality is pretty good, but there’s just too little creativity. Give people something they haven’t tried before. The taco platter from Taco Republica. Conchinita pibil (pork) and tinga de pollo (chicken). Kamai has made a twist on several dishes with their ‘poke rice bowl’. The Hawaiian dish poke was predicted to be the next trendy food item this year, after burger, taco and ceviche had their spot in the limelight. Helle’s Kitchen wrote about it earlier this year and, lo and behold, a poke bowl truck just opened at Aker Brygge in Oslo. Kamai’s dish, however, is quite far from the original. There’s no raw fish, it’s replaced by chicken and the dish is served warm with a curry sauce. I recommend this dish especially if the weather makes you cold, but it’s not gonna be the next trend dish. 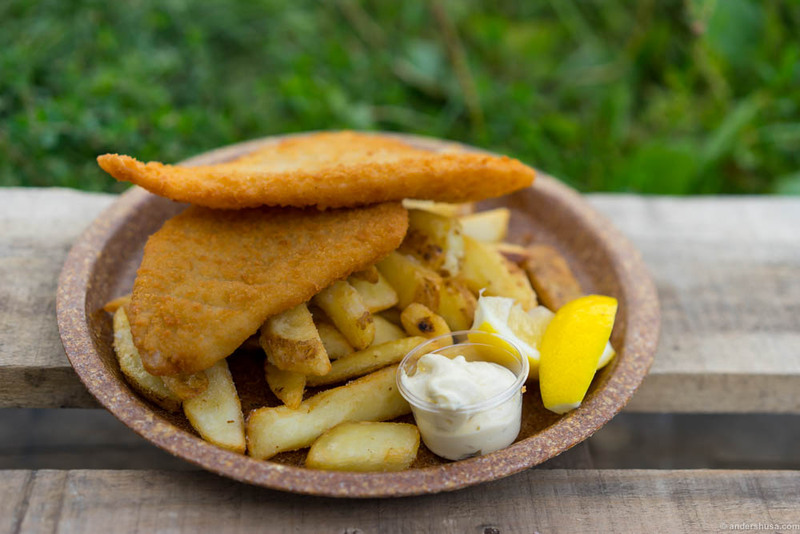 This fish’n’chips dish by Pøbberiet is better than it looks. Both the fish and chips are crispy. The English style fries have that mushy, potato mash kind of core you want. I just wish there was a bit more mayo to dip them in, because mayo is so damn good. I asked Pøbberiet about the slightly untraditional flat presentation of the fried fish. 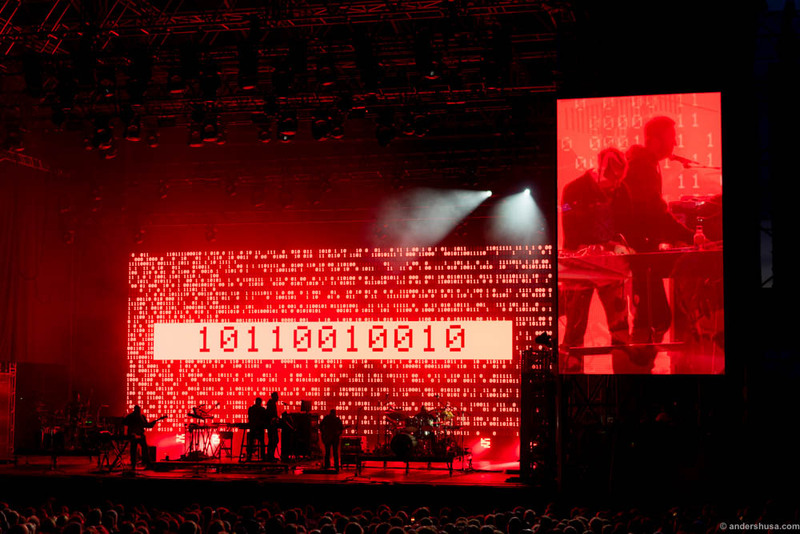 The explanation was the requirement of 100 % organic ingredients by the Øya festival. Originally, Pøbberiet planned to use a wild cod from their local fisherman. That was declined as not certified organic enough, and thus they had to get the flatfish plaice in stead. Remember to squeeze lemon all over the fish! As for the presentation, I wish it was served in a cone in stead. That’s more festival style. 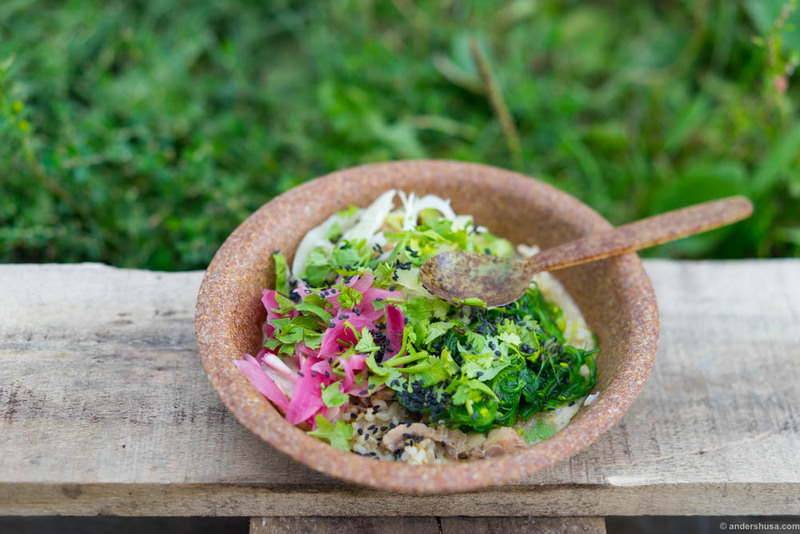 The brown plates supplied by the Øya festival makes the dish appear more boring than it is. Also, if Pøbberiet had added some green herbs to the mayo, that would help make the plate look more fresh. Kulinarisk Akademi was resonsible for all the food in the VIP area. A whole team of chefs was working to serve the guest area, and they offered more dishes than any other place. 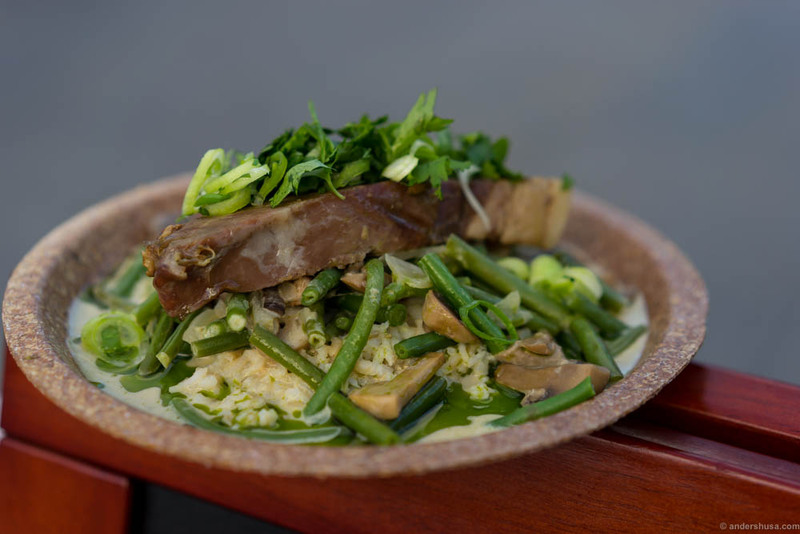 Their take on a thai green curry was by far the best dish on their menu. 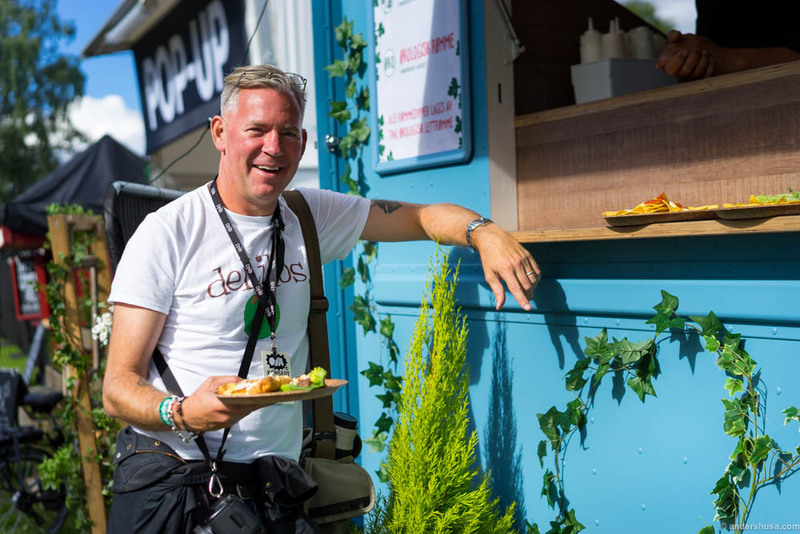 Which dish was your favorite at the Øya festival 2016?